A Cookbook for using OVN for OpenStack Networking Tasks. Open Virtual Network (OVN) is an Open vSwitch-based software-defined networking (SDN) solution for supplying network services to instances. OVN provides platform-agnostic support for the full OpenStack Networking API. OVN allows you to programmatically connect groups of guest instances into private L2 and L3 networks. OVN uses a standard approach to virtual networking that is capable of extending to other Red Hat platforms and solutions. The minimum OVS version required is OVS 2.9. This section describes the steps required to deploy OVN using director. OVN is supported only in an HA environment. We recommend that you deploy OVN with distributed virtual routing (DVR). 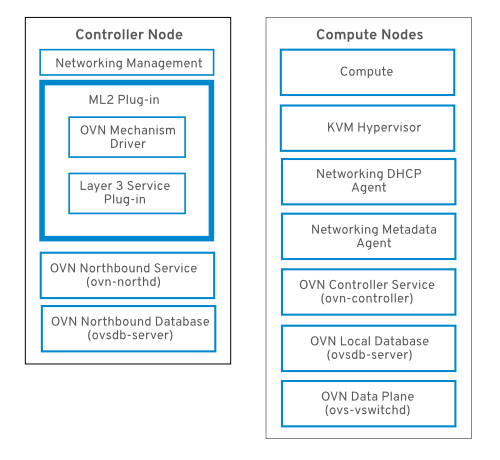 The OVN architecture replaces the OVS ML2 plugin with the OVN Modular Layer 2 (ML2) plugin to support the Networking API. OVN provides robust networking services for the Red Hat OpenStack platform. Translates the OpenStack-specific networking configuration into the platform-agnostic OVN logical networking configuration. This plugin typically runs on the Controller node. Stores the logical OVN networking configuration from the OVN ML2 plugin. This database typically runs on the Controller node and listens on TCP port 6641. Converts the logical networking configuration from the OVN NB database to the logical data path flows and populates these on the OVN Southbound database. This service typically runs on the Controller node. Stores the converted logical data path flows. This database typically runs on the Controller node and listens on TCP port 6642. Connects to the OVN SB database and acts as the open vSwitch controller to control and monitor network traffic. Runs on all Compute and gateway nodes where OS::Tripleo::Services::OVNController is defined. Spawns the haproxy instances for managing the OVS interfaces, network namespaces and HAProxy processes used to proxy metadata API requests. Runs on all Compute and gateway nodes where OS::TripleO::Services::OVNMetadataAgent is defined. Deploy OVN in HA deployments only. We recommend you deploy with distributed virtual routing (DVR) enabled. To use OVN, your director deployment must use Generic Network Virtualization Encapsulation (Geneve), and not VXLAN. Geneve allows OVN to identify the network using the 24-bit Virtual Network Identifier (VNI) field and an additional 32-bit Type Length Value (TLV) to specify both the source and destination logical ports. You should account for this larger protocol header when you determine your MTU setting. Deploy OVN with DVR in an HA environment. OVN is supported only in an HA environment. The neutron-ovn-dvr-ha.yaml environment file configures the required DVR-specific parameters for deployments using OVN in an HA environment. The ovn-controller service runs on each Compute node and connects to the OVN SB database server to retrieve the logical flows. The ovn-controller translates these logical flows into physical OpenFlow flows and adds the flows to the OVS bridge (br-int). To communicate with ovs-vswitchd and install the OpenFlow flows, the ovn-controller connects to the local ovsdb-server (that hosts conf.db) using the UNIX socket path that was passed when ovn-controller was started (for example unix:/var/run/openvswitch/db.sock). The director has a composable service for OVN named ovn-dbs with two profiles: the base profile and the pacemaker HA profile. The OVN northbound and southbound databases are hosted by the ovsdb-server service. Similarly, the ovsdb-server process runs alongside ovs-vswitchd to host the OVS database (conf.db). The schema file for the NB database is located in /usr/share/openvswitch/ovn-nb.ovsschema , and the SB database schema file is in /usr/share/openvswitch/ovn-sb.ovsschema. In addition to the required HA profile, Red Hat recommends that you deploy OVN with DVR to ensure the availability of networking services. With the HA profile enabled, the OVN database servers start on all the Controllers, and pacemaker then selects one controller to serve in the master role. The ovsdb-server service does not currently support active-active mode. It does support HA with the master-slave mode, which is managed by Pacemaker using the resource agent Open Cluster Framework (OCF) script. Having ovsdb-server run in master mode allows write access to the database, while all the other slave ovsdb-server services replicate the database locally from the master, and do not allow write access. The YAML file for this profile is the tripleo-heat-templates/environments/services-docker/neutron-ovn-dvr-ha.yaml file. When enabled, the OVN database servers are managed by Pacemaker, and puppet-tripleo creates a pacemaker OCF resource named ovn:ovndb-servers. The OVN database servers are started on each Controller node, and the controller owning the virtual IP address (OVN_DBS_VIP) runs the OVN DB servers in master mode. The OVN ML2 mechanism driver and ovn-controller then connect to the database servers using the OVN_DBS_VIP value. In the event of a failover, Pacemaker moves the virtual IP address (OVN_DBS_VIP) to another controller, and also promotes the OVN database server running on that node to master. OVN supports Layer 3 high availability (L3 HA) without any special configuration. OVN automatically schedules the router port to all available gateway nodes that can act as an L3 gateway on the specified external network. OVN L3 HA uses the gateway_chassis column in the OVN Logical_Router_Port table. Most functionality is managed by OpenFlow rules with bundled active_passive outputs. The ovn-controller handles the Address Resolution Protocol (ARP) responder and router enablement and disablement. Gratuitous ARPs for FIPs and router external addresses are also periodically sent by the ovn-controller. L3HA uses OVN to balance the routers back to the original gateway nodes to avoid any nodes becoming a bottleneck. OVN uses the Bidirectional Forwarding Detection (BFD) protocol to monitor the availability of the gateway nodes. This protocol is encapsulated on top of the Geneve tunnels established from node to node. Each gateway node monitors all the other gateway nodes in a star topology in the deployment. Gateway nodes also monitor the compute nodes to let the gateways enable and disable routing of packets and ARP responses and announcements. Each compute node uses BFD to monitor each gateway node and automatically steers external traffic, such as source and destination Network Address Translation (SNAT and DNAT), through the active gateway node for a given router. Compute nodes do not need to monitor other compute nodes. External network failures are not detected as would happen with an ML2-OVS configuration. The gateway node becomes disconnected from the network (tunneling interface). ovn-controller stops (ovn-controller removes itself as a registered node). This BFD monitoring mechanism only works for link failures, not for routing failures. This section details an in-place migration strategy from ML2/OVS to ML2/OVN in either ovs-firewall or ovs-hybrid mode for a TripleO OpenStack deployment. For non TripleO deployments, see the file migration/README.rst and the Ansible playbook migration/migrate-to-ovn.yml. The migration process is orchestrated through the shell script ovn_migration.sh, which is provided with networking-ovn. The administrator uses ovn_migration.sh to perform readiness steps and migration from the undercloud node. The readiness steps, such as host inventory production, DHCP and MTU adjustments, prepare the environment for the procedure. Subsequent steps start the migration via Ansible. Plan for a 24-hour wait after the setup-mtu-t1 step to allow VMs to catch up with the new MTU timing. The default neutron ML2/OVS configuration has a dhcp_lease_duration of 86400 seconds (24h). Also, if there are instances using static IP assignment, the administrator should plan to lower the MTU of those instances to the new value of 8 bytes less than the ML2/OVS (VXLAN) MTU value. For example, the typical 1500 MTU network value that makes VXLAN tenant networks use 1450 bytes of MTU must change to 1442 under Geneve. Or under the same overlay network, a GRE encapsulated tenant network would use a 1458 MTU, but again a 1442 MTU for Geneve. If there are instances which use DHCP but don’t support lease update during the T1 period the administrator must reboot them to ensure that MTU is updated inside those instances. Ensure that you have updated to the latest openstack/neutron version in the undercloud/overcloud. In your overcloud-deploy.sh script, remove any references to files specific to neutron ovs, such as neutron-ovs-dvr.yaml and neutron-ovs-dpdk.yaml. Create the overcloud-deploy-ovn.sh script in your $HOME. This script must source your stackrc file, and then execute an openstack overcloud overcloud deploy with your original deployment parameters plus the following environment files. Make sure that all users have execution privileges on the script, because it is called by ovn_migration.sh/ansible during the migration process. Make sure that the overcloud-deploy-ovn.sh script does not contain any references to files specific to neutron ovs, such as neutron-ovs-dvr.yaml and neutron-ovs-dpdk.yaml. To configure the parameters of your migration you can set the environment variables that will be used by `ovn_migration.sh. You can skip setting any values matching the defaults. STACKRC_FILE - must point to your stackrc file in your undercloud. OVERCLOUDRC_FILE - must point to your overcloudrc file in your undercloud. OVERCLOUD_OVN_DEPLOY_SCRIPT - must point to the deployment script. PUBLIC_NETWORK_NAME - Name of your public network. To support migration validation, this network must have available floating IP addresses, and those floating IP addresses must be pingable from the undercloud. If that is not possible, configure VALIDATE_MIGRATION to False. IMAGE_NAME - Name/ID of the glance image to us for booting a test server. The image is automatically downloaded during the pre-validation / post-validation process. VALIDATE_MIGRATION - Create migration resources to validate the migration. The migration script, before starting the migration, boot a server and validates that the server is reachable after the migration. SERVER_USER_NAME - User name to use for logging to the migration instances. DHCP_RENEWAL_TIME - DHCP renewal time in seconds to configure in DHCP agent configuration file. VALIDATE_MIGRATION requires enough quota (2 available floating IP addresses, 2 networks, 2 subnets, 2 instances, and 2 routers as admin). Run ovn_migration.sh generate-inventory to generate the inventory file hosts_for_migration and the ansible.cfg file. Review hosts_for_migration for correctness. Run ovn_migration.sh setup-mtu-t1. This lowers the T1 parameter of the internal neutron DHCP servers configuring the dhcp_renewal_time in /var/lib/config-data/puppet-generated/neutron/etc/neutron/dhcp_agent.ini in all the nodes where DHCP agent is running. If you are using VXLAN or GRE tenant networking, wait at least 24 hours before continuing. This allows VMs to catch up with the new MTU timing of the next step. If you are using VXLAN or GRE networks, this 24-hour wait step is critical. If you are using VLAN tenant networks you can proceed to the next step without delay. If you have any instances with static IP assignation on VXLAN or GRE tenant networks, you must manually modify the configuration of those instances to configure the new Geneve MTU, which is the current VXLAN MTU minus 8 bytes. For instance, if the VXLAN-based MTU was 1450, change it to 1442. If your instances don’t honor the T1 parameter of DHCP, they must be rebooted. One way to verify that the T1 parameter has propagated to existing VMs is to connect to one of the compute nodes and run tcpdump over one of the VM taps attached to a tenant network. If T1 propagation was a success, you should see that requests happen on an interval of approximately 30 seconds. This verification is not possible with cirros VMs. The cirros udhcpc implementation does not obey DHCP option 58 (T1). Try this verification on a port that belongs to a full Linux VM. It is recommended that you check all the different types of workloads your system runs (Windows, different flavors of Linux, etc..). This step reduces the MTU network by network and tags the completed network with adapted_mtu. The tool ignores non-VXLAN/GRE networks, so if you use VLAN for tenant networks, this step is not expected to change any values. Make Tripleo prepare the new container images for OVN. Provide the full path to your containers-prepare-parameter.yaml file. Otherwise the command completes very quickly without updating the images or providing an error message. TripleO validates the containers and pushes them to your local registry. Run ovn_migration.sh start-migration to kick-start the migration process. The script performs the following actions. Creates pre-migration resources (network and VM) to validate existing deployment and final migration. Updates the overcloud stack to deploy OVN alongside reference implementation services using the temporary bridge br-migration instead of br-int. Generates the OVN north db by running neutron-ovn-db-sync util. Clones the existing resources from br-int to br-migration, to allow ovn to find the same resource UUIDS over br-migration. Re-assigns ovn-controller to br-int instead of br-migration. Cleans up network namespaces (fip, snat, qrouter, qdhcp). Removes any unnecessary patch ports on br-int. Removes br-tun and br-migration ovs bridges. Deletes qr-, ha- and qg-* ports from br-int (via neutron netns cleanup). Deletes neutron agents and neutron HA internal networks from the database via API. Validates connectivity on pre-migration resources. Validates connectivity on post-migration resources. Re-runs the deployment tool to update OVN on br-int. Enables the OVN ML2 plugin and generates the necessary configuration options. Deploys the OVN databases and the ovn-northd service on the controller node(s). Deploys ovn-controller on each Compute node. Deploys neutron-ovn-metadata-agent on each Compute node. This guide deploys OVN with DVR in an HA environment. Verify that the value for OS::TripleO::Compute::Net::SoftwareConfig in the environments/services-docker/neutron-ovn-dvr-ha.yaml file is the same as the OS::TripleO::Controller::Net::SoftwareConfig value in use. This can normally be found in the network environment file in use when deploying the overcloud, for example, in the environments/net-multiple-nics.yaml file. This creates the appropriate external network bridge on the Compute node. If customizations have been made to the network configuration of the Compute node, it may be necessary to add the appropriate configuration to those files instead. For production environments (or test environments that require special customization, such as network isolation or dedicated NICs, you can use the example environments as a guide. Pay special attention to the bridge mapping type parameters used, for example, by OVS and any reference to external facing bridges. The OVN metadata agent is configured in the tripleo-heat-templates/docker/services/ovn-metadata.yaml file and included in the default Compute role through OS::TripleO::Services::OVNMetadataAgent. As such, the OVN metadata agent with default parameters is deployed as part of the OVN deployment. See Chapter 4, Deploying OVN with director. OpenStack guest instances access the Networking metadata service available at the link-local IP address: 169.254.169.254. The neutron-ovn-metadata-agent has access to the host networks where the Compute metadata API exists. Each HAProxy is in a network namespace that is not able to reach the appropriate host network. HaProxy adds the necessary headers to the metadata API request and then forwards the request to the neutron-ovn-metadata-agent over a UNIX domain socket. The OVN Networking service creates a unique network namespace for each virtual network that enables the metadata service. Each network accessed by the instances on the Compute node has a corresponding metadata namespace (ovnmeta-<net_uuid>). USER@INSTANCE_IP_ADDRESS is the user name and IP address for the local instance you want to troubleshoot. You can use the ovn-trace command to monitor and troubleshoot OVN logical flows, and you can use the ovs-ofctl dump-flows command to monitor and troubleshoot OpenFlows. OVN uses logical flows that are tables of flows with a priority, match, and actions. These logical flows are distributed to the ovn-controller running on each Compute node. You can use the ovn-sbctl lflow-list command on the Controller node to view the full set of logical flows, as shown in this example. OVN ports are logical entities that reside somewhere on a network, not physical ports on a single switch. OVN gives each table in the pipeline a name in addition to its number. The name describes the purpose of that stage in the pipeline. The OVN match syntax supports complex Boolean expressions. The actions supported in OVN logical flows extend beyond those of OpenFlow. You can implement higher level features, such as DHCP, in the OVN logical flow syntax. See the OpenStack and OVN Tutorial for a complete walk through of OVN monitoring options with this command. The logical switch or logical router where the simulated packet starts. The simulated packet, in the syntax used by the ovn-sb database. The packet enters the sw0 network from the sw0-port1 port and runs the ingress pipeline. The outport variable is set to sw0-port2 indicating that the intended destination for this packet is sw0-port2. The packet is output from the ingress pipeline, which brings it to the egress pipeline for sw0 with the outport variable set to sw0-port2. The output action is executed in the egress pipeline, which outputs the packet to the current value of the outport variable, which is sw0-port2. See the ovn-trace man page for complete details. You can use ovs-ofctl dump-flows command to monitor the OpenFlow flows on a logical switch in your network.